Fall of Reach is arguably the worst novel of the 50 or so audiobooks I've listened to this year alone. This story is essentially a retelling of Ender's Game minus the character development that made Orson Scott Card's series one of the best sci-fi novels of all time. 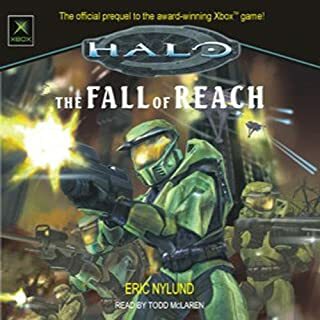 For a novel titled "the Fall of Reach," you would expect Reach to be a character all unto itself, but it's not. Thus, when the planet is inevitably destroyed, there is no emotional weight attached to make you care. Likewise, the characters are all uninteresting, faceless marines. We never witness their growth from an emotional standpoint, only from a physical standpoint. I understand that these are Spartans whose sole goal is to fight, but their humanity was lost in the process, and consequently, there isn't an ounce of character left in their soul. They are uninteresting, flat characters, and just like the planet Reach, when a Spartan dies, you're left without a care in the world. I expected a sense of camaraderie to develop between this elite unit of Spartans, but none is ever built. This is not the sci-fi version of Band of Brothers despite a heavy emphasis on this stand-alone, elite group of warriors. This lack of characterization wouldn't be a problem if the story was interesting, but it's not. In summary, these spartans are stolen as children, rigorously trained, infused with armor, and told to fight. There's nothing unique about this story. As I've said, it has been done before (Ender's Game), and it has been done better. Save yourself the time, money, and effort of listening to this book. I'm an avid Halo fan and a devout reader, but this never tapped into either vein. It is neither a good book nor a good Halo story. The narrator is dry and boring, and I would never consider buying another audiobook by this author or this narrator again. PLEASE AVOID AT ALL COSTS. An imaginative romp through a beautiful world filled with unique and interesting inhabitants makes Treason an enjoyable and creative adventure that I highly recommend. Card's description of this realm will send your imagination on a fun ride that will leave you wanting more. My only complaint is that Card's description of the main character's female genitalia growing on his male body became too descriptive, and consequently, too awkward at times to bear, but it's a minor gripe of an otherwise exceptional novel. Rudnicki's narration, yet again, is excellent to say the least. Anyone who enjoyed him as Ender will likewise enjoy him here. Just an overall entertaining read. I can't help but be overwhelmingly dissappointed by this book. 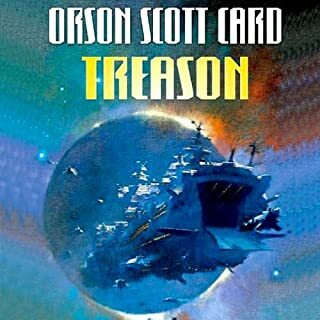 After having read nearly 20 various OSC books from his early works, Treason, to his popular works, Ender Series, to his new material, Pathfinder, I have yet to find a book by him that I didn't enjoy. 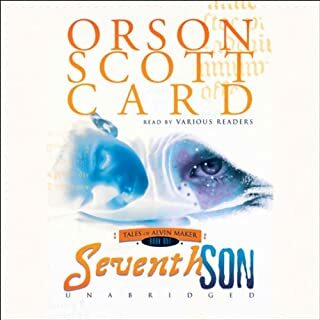 With that being said though, Seventh Son was an uneventful story that never captivated my heart whereas these aforementioned novels all did. The main problem with Seventh Son lies in the fact that there is little to no character development at all. Not only did I not grow to understand or genuinely like the characters, but I also felt the plot was drawn out and very little actually happened throughout the entire book. I wish I had enough room to fully explain my complaints with Seventh Son, but unfortunately I don't. The only saving grace for this audiobook lies within the excellent narration from Brick and Rudnicki. I can't say I'll be returning to this series though.